Imagine being able to use WhatsApp without phone number or SIM card. In this post you will be learning two tried and tested methods of using this extremely popular messaging system on your Android tablet, iPad, PC and even your mobile phone that does not have a SIM card. As mentioned above, we have tested two different methods of using WhatsApp without phone number or SIM card and you can try both these methods and use the one that is most convenient to you. Before we move to any of the two methods, you will need to go through the following prerequisites for using WhatsApp without phone number and SIM card. Download WhatsApp to your tablet, phone or PC if you already haven’t. In case you have already installed WhatsApp to your device, check whether or not you have verified WhatsApp yet. If you have already verified WhatsApp, then delete your current number from WhatsApp by uninstalling the app and reinstalling it back. The first method involves downloading a messaging app called TextNow to your phone. This messaging app gives you a unique phone number which you can enter into WhatsApp and use to verify your account. Download the TextNow app to your device from the Google Play Store, iTunes App store or the Windows Phone Store. If you are trying to use WhatsApp on PC then you need to open your Android emulator and search for TextNow in it. Once the TextNow app is downloaded to your device, open it up and complete the setup process. Once the app is setup note down your number. In case TextNow does not show you your number or you forgot to note down your number you can find out your TextNow number by following the steps below. Android: Once the app opens on your Android phone click on the 3 line icon located in the top left corner of your Android device and you should see your phone number. iPhone: Click on the 3 line icon which is located in the top left corner of your iPhone, iPod or iPad. Once you click on the 3 line icon you should be seeing your phone number. Windows Phone: Once app is open navigate to the People tab and you should see your phone number. Once you have noted down your TextNow number, open up WhatsApp on your phone, tablet or PC and follow steps 3.1 to 3.5 below. Once you agree to the terms and conditions of WhatsApp you will be prompted to enter your number. When prompted to enter your number select your country and enter the TextNow number. Wait 5 minutes for SMS verification to fail. After SMS verification fails you will be prompted to call your number. Click on the Call Me button to receive an automated call from WhatsApp. Open the TextNow app on your device and you should be receiving a call from WhatsApp. Answer the call and an automated message from WhatsApp will be repeating your verification code numerous times. Note down your verification number. Now, enter the verification code that you received from the automated call into WhatsApp. Finish the setup process in WhatsApp after entering your verification code. You have now successfully created a WhatsApp account without a phone number. In case this method did not work for you, you can try using another app called textPlus or you can use the second Method below. The second method will be using your existing home phone/landline number to verify WhatsApp. 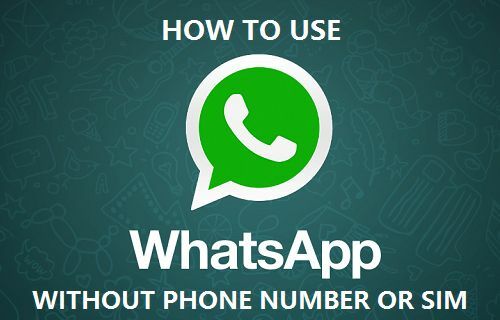 Just follow the steps below to use WhatsApp without a mobile phone number or SIM card. Open up the WhatsApp application on your phone, tablet or PC. When prompted to enter your number select your country and enter your home phone/landline number. After about 5 minutes verification by SMS will fail and you will be presented with an option to Call Me. Click on the Call Me option to get a call from WhatsApp to your home phone/landline number. You will now get an automated call from WhatsApp to your landline number. An automated voice will repeat your 6 digit verification code numerous times. Note down this verification code and enter this verification code into WhatsApp. Once you have verified WhatsApp on your device, complete the setup process and you are ready to start talking to your friends on WhatsApp without using your mobile phone number or SIM card.